We have been having several pet issues this week. 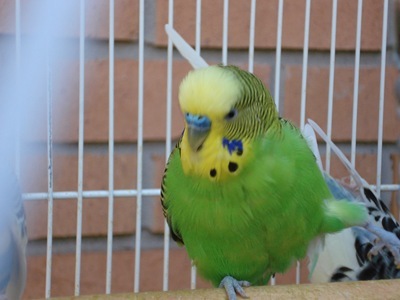 Last time I blogged, I wrote about Pipsqueak, our lovebird, dying. But, the day before Pipsqueak died, my cockatiel, Penny, had a stroke (or something), that scared the dickens out of me. Penny: Penny spends a lot of her time with me. If I am in my lazy boy chair, like now, typing or watching a movie or crocheting, Penny is on my shoulder or on a perch on the armrest, or running back and forth the two. 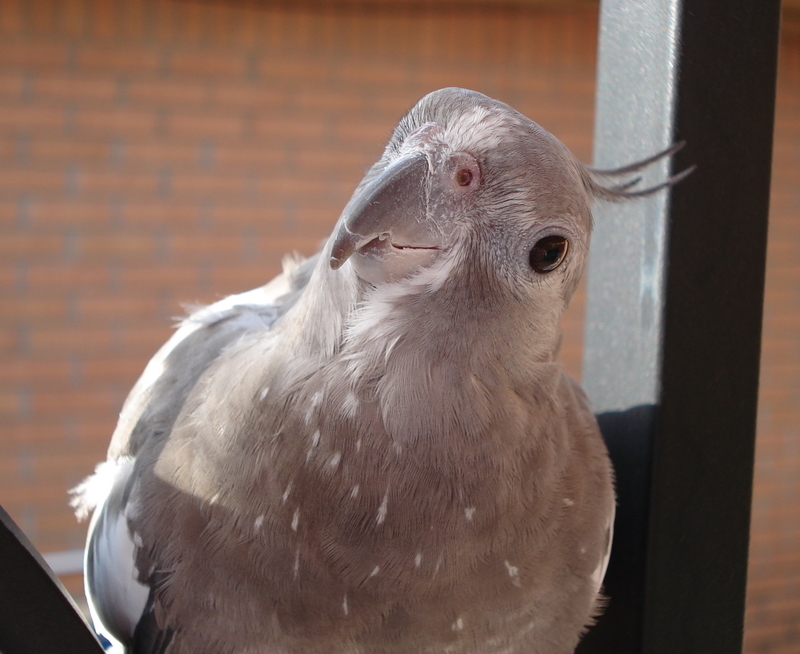 Well, a couple of days ago, while Penny was on the armrest perch, her right wing shot up into the air and stayed there. At the same time, her right leg collapsed.I picked her up and put her on my chest while I examined her. She could not walk, she just tipped over. It was very, very scary for me. While I held Penny with one hand, I called my hubby with the other hand and asked him to pray for Penny. After we prayed, we visited more on the phone. Penny is my constant companion, and it was very stressful for me to think she was about to die. The thing with birds, they hardly ever have any symptoms. Usually, the first hint that something is wrong is when they die. I was thinking that Penny was going to die right then and there. As my hubby and I talked on the phone, I was describing what Penny was doing. My hubby works just around the corner and he was going to rush home and take me and Penny to the vet. The bird vet is just a few doors down from where he works. We could have gotten her to the vet in just a few minutes.But, whatever happened, it went away. Gradually, her wing went back into place, and she gained control of her right side. Suddenly, she was all back to normal, just walking around on my chest, and then she ran down my arm to get back on her perch. The whole incident just lasted five minutes or so.I told my hubby that she was all back to normal, and that I would just keep an eye on her.So what happened? Was her foot asleep? Was it a charlie horse? Did she have a mini-stroke? I don’t know. She is her usual self now, like nothing ever happened. But, I know that Penny is a very old bird. I know she doesn’t have much time, anyway. Lily: In addition to the bird problems, we also have three quite elderly dogs. 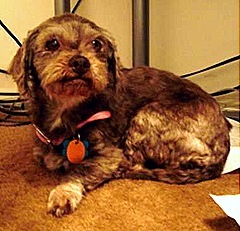 Our oldest dog, Lily, is getting worse and worse in the last few days. We took her in just two years ago. She had been abandoned. She was already totally deaf and mostly blind when we got her. Now she is getting incontinent, and confused and just wanders around aimlessly. We’ve been thinking hard about what is best for her, wondering whether she is having a happy life. Homeless Pet TownMy house is where homeless pets come to live out the rest of their lives. Most of our pets come from sad situations. The cute baby animals don’t have much of a problem finding homes, but the old, handicapped, abandoned and mistreated pets come to live with us. Whenever we get a new pet, it is a pet who needs us, one that wouldn’t have much of a chance otherwise. The sad thing is, that when you take in the old, sick, mistreated animals, they don’t tend to live a very long time after they come here. That never gets any easier for me. But, I just have to think of the good times that the pets got to have that they wouldn’t have had otherwise. Fred and Ginger – a Success Story: My two best survivors right now are two handicapped parakeets that have lived here for several years. They were abandoned on a doorstep, literally. A parrot owner had found a shoebox on her porch with two featherless baby parakeets with crippled legs. I happened to be at the pet shop when the babies were brought in, and the pet shop manager asked me to take them. They had to be hand fed, but they grew up just fine. Now, they are both in love. 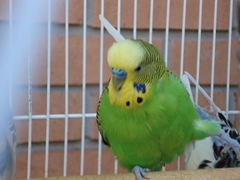 I have six parakeets besides Shelly who was widowed when Pipsqueak died. The six are in three committed relationships. The two handicapped parakeets can’t get around much, but their mates sit beside them and lean their heads on their necks to snuggle. It’s the cutest thing. I am happy I am able to give happy lives to needy pets, but it is very sad when one dies, and that happens way to often around here.Sorry this is so long. If you made it this far down, thank you. I use my blog as a diary to talk out things sometimes, like today.